1 A None No Power Seat 1 A is a standard Executive seat. 1 B None No Power Seat 1 B is a standard Executive seat. 1 E None No Power Seat 1 E is a standard Executive seat. 1 F None No Power Seat 1 F is a standard Executive seat. 1 H None No Power Seat 1 H is a standard Executive seat. 1 J None No Power Seat 1 J is a standard Executive seat. 11 D None No Power Seat 11 D is a standard Economy seat that may have restricted legroom. The close proximity to the lavatories and galleys may be bothersome. 11 E None No Power Seat 11 E is a standard Economy seat that may have restricted legroom. The close proximity to the lavatories and galleys may be bothersome. 11 F None No Power Seat 11 F is a standard Economy seat that may have restricted legroom. The close proximity to the lavatories and galleys may be bothersome. 11 G None No Power Seat 11 G is a standard Economy seat that may have restricted legroom. The close proximity to the lavatories and galleys may be bothersome. 12 A None No Power Seat 12 A is a standard Economy seat that has extra legroom however, the proximity to the lavatories and galleys may be bothersome. 12 B None No Power Seat 12 B is a standard Economy seat that has extra legroom however, the proximity to the lavatories and galleys may be bothersome. 12 H None No Power Seat 12 H is a standard Economy seat that has extra legroom however, the proximity to the lavatories and galleys may be bothersome. 12 J None No Power Seat 12 J is a standard Economy seat that has extra legroom however, the proximity to the lavatories and galleys may be bothersome. 13 G None No Power Seat 13 G is a standard Economy seat. 13 H None No Power Seat 13 H is a standard Economy seat. 13 J None No Power Seat 13 J is a standard Economy seat. 2 A None No Power Seat 2 A is a standard Executive seat. 2 B None No Power Seat 2 B is a standard Executive seat. 2 E None No Power Seat 2 E is a standard Executive seat. 2 F None No Power Seat 2 F is a standard Executive seat. 2 H None No Power Seat 2 H is a standard Executive seat. 2 J None No Power Seat 2 J is a standard Executive seat. 25 A None No Power Seat 25 A is a standard Economy seat that may have limited recline. The proximity to the lavatories and galley may be bothersome. 25 B None No Power Seat 25 B is a standard Economy seat that may have limited recline. The proximity to the lavatories and galley may be bothersome. 25 H None No Power Seat 25 H is a standard Economy seat that may have limited recline. The proximity to the lavatories and galley may be bothersome. 25 J None No Power Seat 25 J is a standard Economy seat that may have limited recline. The proximity to the lavatories and galley may be bothersome. 26 D None No Power Seat 26 D is a standard Economy seat that may have limited recline. The proximity to the lavatories and galley may be bothersome. 26 E None No Power Seat 26 E is a standard Economy seat that may have limited recline. The proximity to the lavatories and galley may be bothersome. 26 F None No Power Seat 26 F is a standard Economy seat that may have limited recline. The proximity to the lavatories and galley may be bothersome. 26 G None No Power Seat 26 G is a standard Economy seat that may have limited recline. The proximity to the lavatories and galley may be bothersome. 27 A None No Power Seat 27 A is a standard Economy seat that has extra legroom due to the exit however, the proximity to the lavatories and galley may be bothersome. 27 B None No Power Seat 27 B is a standard Economy seat that has extra legroom due to the exit however, the proximity to the lavatories and galley may be bothersome. 27 D None No Power Seat 27 D is a standard Economy seat that has extra legroom due to the exit however, the proximity to the lavatories and galley may be bothersome. 27 E None No Power Seat 27 E is a standard Economy seat that has extra legroom due to the exit however, the proximity to the lavatories and galley may be bothersome. 27 F None No Power Seat 27 F is a standard Economy seat that has extra legroom due to the exit however, the proximity to the lavatories and galley may be bothersome. 27 G None No Power Seat 27 G is a standard Economy seat that has extra legroom due to the exit however, the proximity to the lavatories and galley may be bothersome. 27 H None No Power Seat 27 H is a standard Economy seat that has extra legroom due to the exit however, the proximity to the lavatories and galley may be bothersome. 27 J None No Power Seat 27 J is a standard Economy seat that has extra legroom due to the exit however, the proximity to the lavatories and galley may be bothersome. 3 A None No Power Seat 3 A is a standard Executive seat. 3 B None No Power Seat 3 B is a standard Executive seat. 3 E None No Power Seat 3 E is a standard Executive seat. 3 F None No Power Seat 3 F is a standard Executive seat. 3 H None No Power Seat 3 H is a standard Executive seat. 3 J None No Power Seat 3 J is a standard Executive seat. 35 D None No Power Seat 35 D is a standard Economy seat. 36 D None No Power Seat 36 D is a standard Economy seat however this seat may often be bumped by service carts or others passing by due to the awkward configuration transition from 4 to 3 seats. 36 G None No Power Seat 36 G is a standard Economy seat however this seat may often be bumped by service carts or others passing by due to the awkward configuration transition from 4 to 3 seats. 37 D None No Power Seat 37 D is a standard Economy Class seat however legroom may be restricted due to the awkward configuration transition from 3 to 4 seats. 37 E None No Power Seat 37 E is a standard Economy Class seat however legroom may be restricted due to the awkward configuration transition from 3 to 4 seats. 37 F None No Power Seat 37 F is a standard Economy Class seat however legroom may be restricted due to the awkward configuration transition from 3 to 4 seats. 38 D None No Power Seat 38 D is a standard Economy Seat. 39 A None No Power Seat 39 A is a standard Economy seat in the last row of the plane. This seat may have limited to no recline and the close proximity to the galleys may be bothersome. 39 B None No Power Seat 39 B is a standard Economy seat in the last row of the plane. This seat may have limited to no recline and the close proximity to the galleys may be bothersome. 39 D None No Power Seat 39 D is a standard Economy Seat. 4 A None No Power Seat 4 A is a standard Executive seat. 4 B None No Power Seat 4 B is a standard Executive seat. 4 E None No Power Seat 4 E is a standard Executive seat. 4 F None No Power Seat 4 F is a standard Executive seat. 4 H None No Power Seat 4 H is a standard Executive seat. 4 J None No Power Seat 4 J is a standard Executive seat. 40 H None No Power Seat 40 H is a standard Economy seat in the last row of the plane. This seat may have limited to no recline and the close proximity to the galleys may be bothersome. 40 J None No Power Seat 40 J is a standard Economy seat in the last row of the plane. This seat may have limited to no recline and the close proximity to the galleys may be bothersome. 41 D None No Power Seat 41 D is a standard Economy seat however, the proximity to the galleys may be bothersome. 41 F None No Power Seat 41 F is a standard Economy seat however, the proximity to the galleys may be bothersome. 42 D None No Power Seat 42 D is a standard Economy seat in the last row of the plane. This seat may have limited to no recline and the close proximity to the galleys may be bothersome. 42 E None No Power Seat 42 E is a standard Economy seat in the last row of the plane. This seat may have limited to no recline and the close proximity to the galleys may be bothersome. 42 F None No Power Seat 42 F is a standard Economy seat in the last row of the plane. This seat may have limited to no recline and the close proximity to the galleys may be bothersome. 5 A None No Power Seat 5 A is a standard Executive seat. 5 B None No Power Seat 5 B is a standard Executive seat. 5 E None No Power Seat 5 E is a standard Executive seat. 5 F None No Power Seat 5 F is a standard Executive seat. 5 H None No Power Seat 5 H is a standard Executive seat. 5 J None No Power Seat 5 J is a standard Executive seat. 6 A None No Power Seat 6 A is a standard Executive seat however, the proximity to the lavatories and galleys may be bothersome. 6 B None No Power Seat 6 B is a standard Executive seat however, the proximity to the lavatories and galleys may be bothersome. 6 E None No Power Seat 6 E is a standard Executive seat however, the proximity to the lavatories and galleys may be bothersome. 6 F None No Power Seat 6 F is a standard Executive seat however, the proximity to the lavatories and galleys may be bothersome. 6 H None No Power Seat 6 H is a standard Executive seat however, the proximity to the lavatories and galleys may be bothersome. 6 J None No Power Seat 6 J is a standard Executive seat however, the proximity to the lavatories and galleys may be bothersome. Executive Class is equipped with 110V power outlets. There is no power in Economy class. This equipment type is used on the airline's long-haul routes, including to North and South America. It's outfitted in a two class configurations with 36 angled flat Executive seats and 232 standard Economy seats. 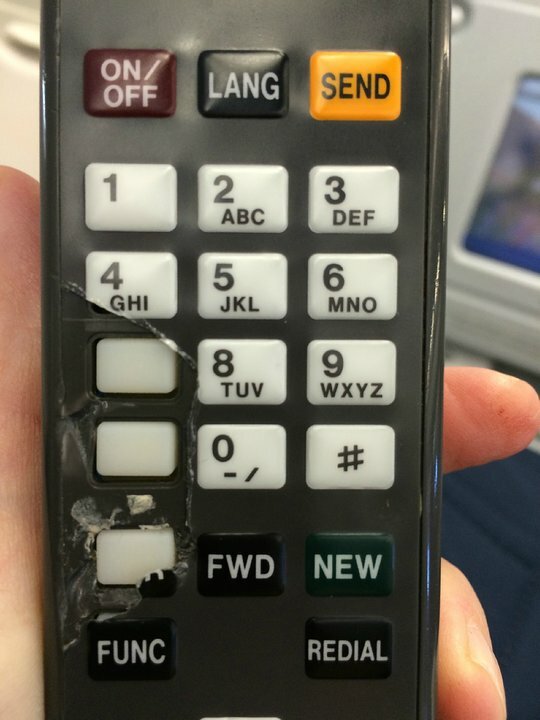 This hard business product is unbelievable outdated. The photos here from 2014 still apply. This old bulky seats leave you with a kind of claustrophobic impression. My feet barely fit into the tiny space left over when the seat is in his "flat" position. Flat means in this case that you still are not parallel to the floor. So for a day flight the product is acceptable. For a red eye I would not recommend it. At least IFE is individual and not channels like mentioned in some other older reviews about TAP's transatlantic product. Two seats were obviously broken at departure and engineers tried to fix it which caused a delay of 30 minutes. Don't think they succeeded. very convenient, close to the toilet and snack area. the screen is not aligned in from of the seat because the front roll are 4 seats. but take it if you are not in a hurry and are travelling 2 adults + 1 child. Footspace limited due to wiring panel. Although this seat has some extra leg room, it is considerably narrower than the average seats, probably because of the tray and TV inserted in armrests. 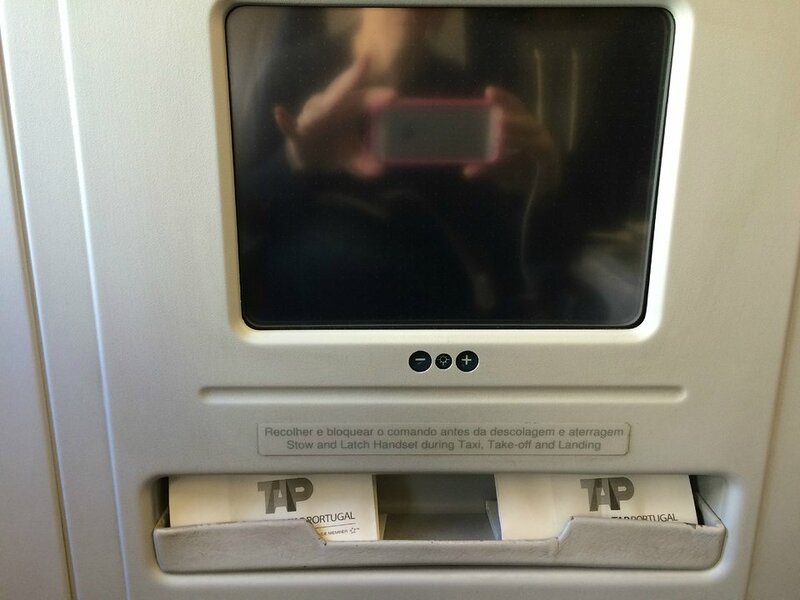 Also, I flew Rio-Lisbon on this plane and it was really old, with an outdated entertainment system to be ashamed of. There is a plastic box under the seat in front of you cutting your legroom in half (37a and 37b). I was able to move to 38a and noticed these two seats had more legroom. 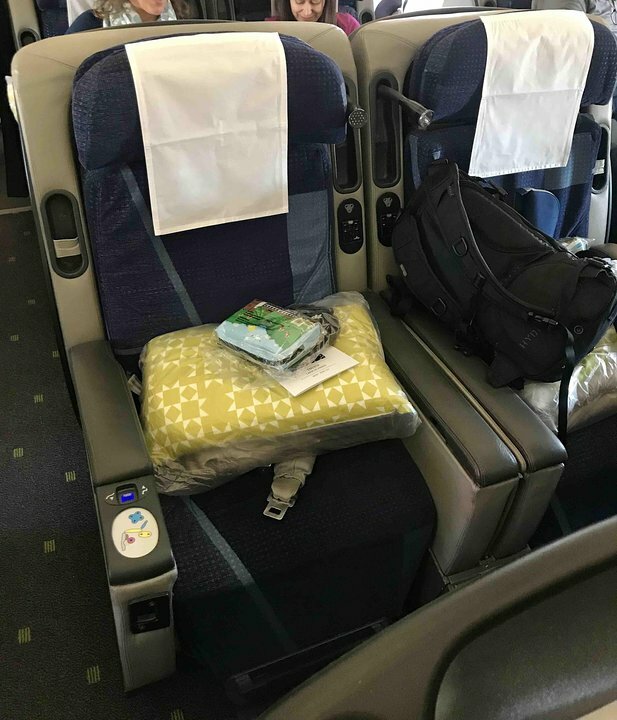 TAP has retrofitted their entire A340 with new seats in Economy class. The inflight entertainment has also been changed to on demand with usb charging ports in the whole aircraft. Business class also has new entertainment and screen. 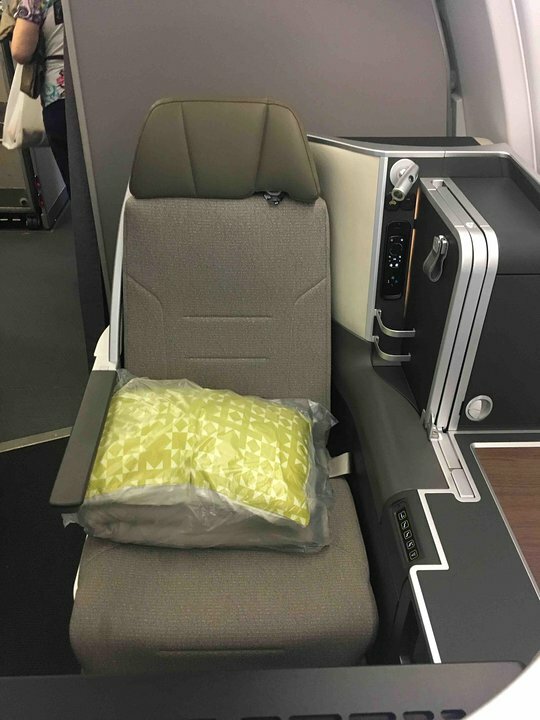 Business class seats are newer but still semi-lay flat has the old ones. 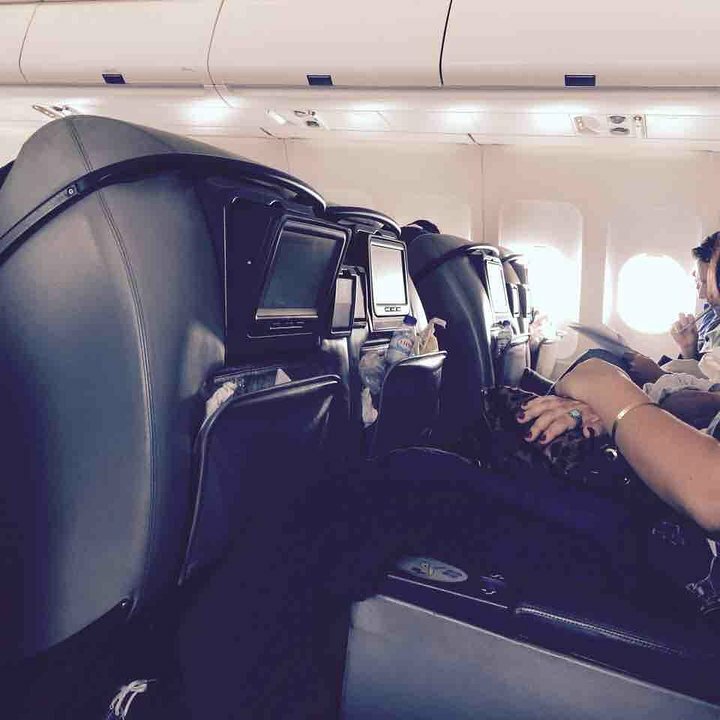 Business class seats are also fitted with airbags in the seats belts due to the pitch. TAP Portugal flies 1 versions of Airbus A340-300.